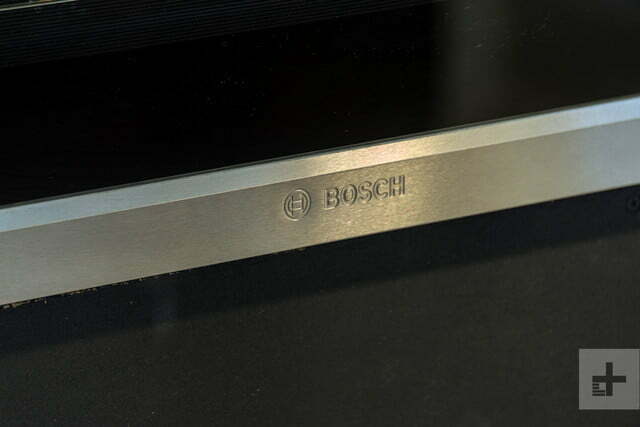 The name Bosch renders images of appliances that sport a sleek design and scream luxury. Rightfully so, as the company makes some pretty stylish products. The Bosch 24” Wall Oven Series 500 ($1,999) is no exception, and smart home integration features make it even more luxurious. 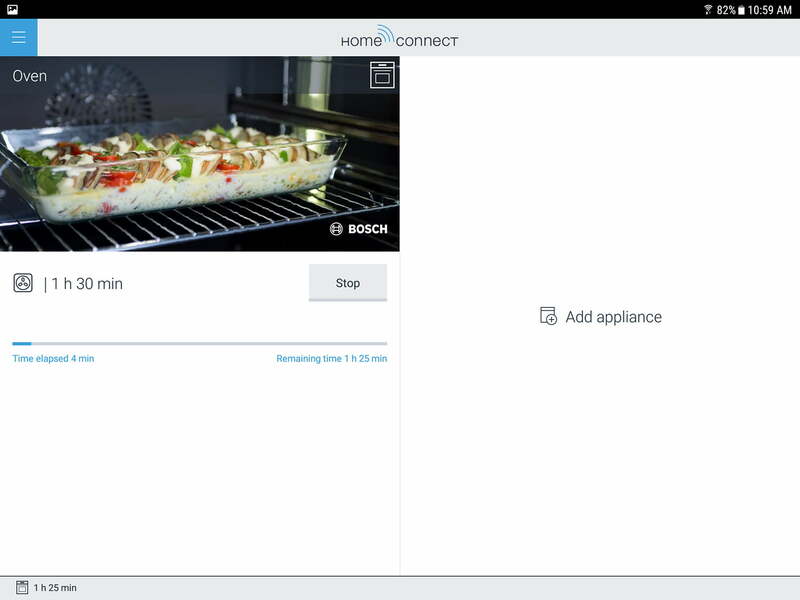 As a straight-up oven, it does a solid job of cooking food, but the Home Connect app brings cooking with this oven to another level. We spent some time in the kitchen with the Bosch to test out both its cooking abilities and the corresponding app. The Bosch HBE5452UC 24-inch wall oven will definitely draw “ooh’s” and “aah’s” in any kitchen — it is that attractive. 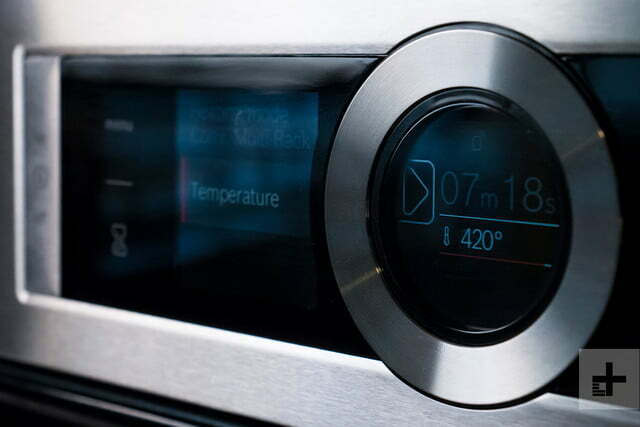 The oven’s black glass and stainless steel exterior, coupled with its unique ring control panel with TFT display conjures up images of a high-end race car. You can even watch the progress of the oven heating up and cooking food on the display, thanks to the red line that follows the circle inside the ring control. Additionally, the TFT screen also displays the temperature as it gets closer to the desired heat level. Open the door of the oven and you’ll find three adjustable silver racks that are easy to remove or re-arrange depending on what you’re cooking. The oven has five rack positions, so there’s a lot of flexibility. The interior is very small, though, measuring just 14 inches high by 18.9 inches wide and 16.3 inches deep. To provide some perspective, we could fit a small cookie sheet in the oven, but not a standard-sized one. You could cook a whole chicken in it (we cooked a six pounder and had a little bit of room to spare), but you wouldn’t be able to fit a whole turkey to serve at a large family gathering. 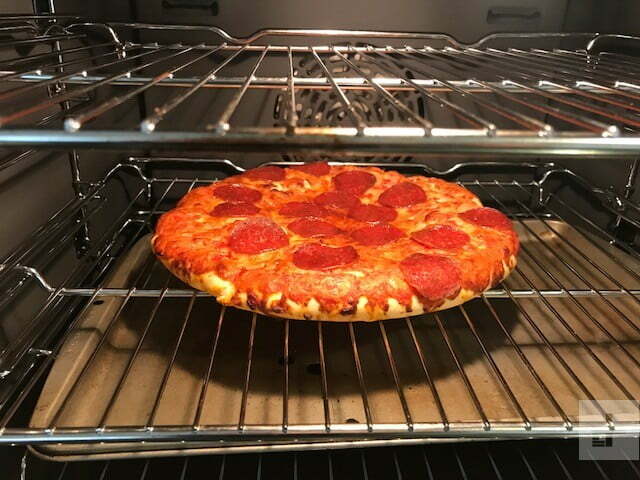 The oven is large enough to accommodate the average frozen pizza, but not a larger one. None of these examples are a dig at the oven. After all, this is advertised as a 24-inch oven and handles what it should for its size. The real eye pleaser is the unique ring that controls the oven settings. It’s a bit different than the typical push-button controls found on ovens like the GE Profile Series Built-In Double Convection Oven or knobs that are on the Frigidaire Professional FPEW3077RF. Speaking of the control panel, there’s a lot to do with it. While all the options might initially be a bit overwhelming, controlling the oven is actually quite intuitive. 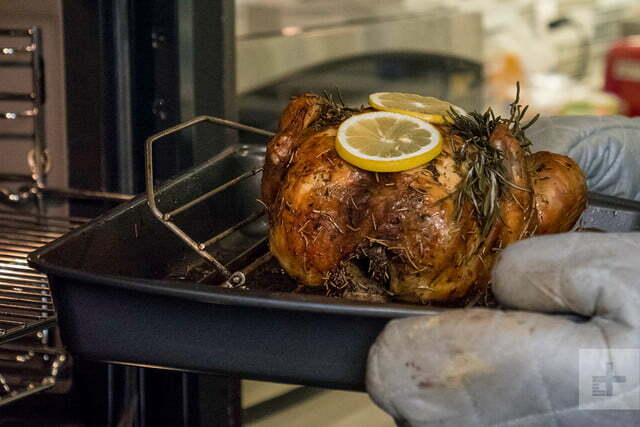 Let’s be clear: As a straight-up oven, it does a solid job cooking food. Bordering the black touch control panel on either side are on/off and start/stop buttons. You’ll also find options for menu, clock, information, and a child’s lock. 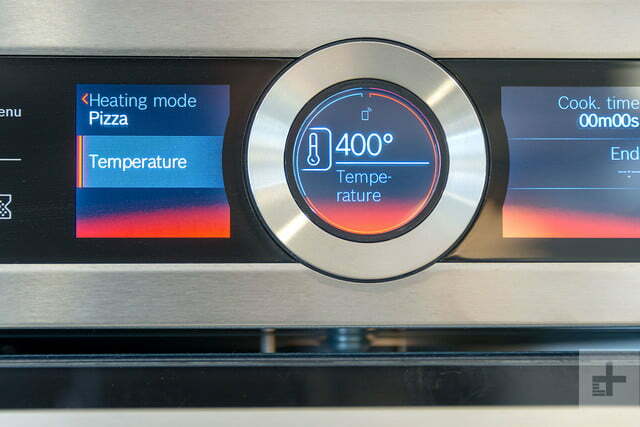 Use the menu button to access the operating modes, including heating modes, dishes (things you might cook often, EcoClean (to clean the oven), Home Connect Assistant (to connect the oven to your mobile device – more on that later), and basic settings. 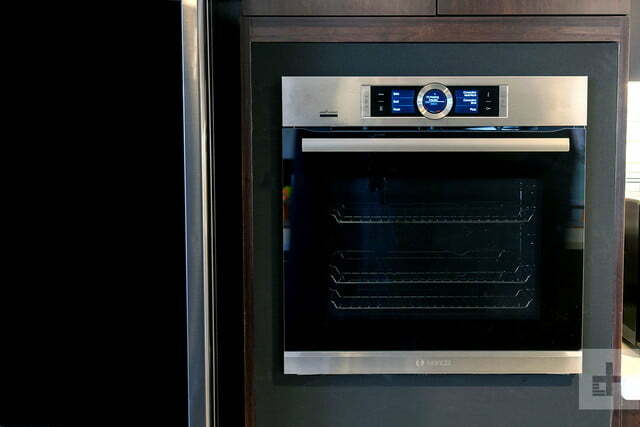 The circle in the middle of the display is a touch-sensitive ring that you rotate with the light press of a finger to do everything from determining heating temperatures to selecting cooking options. 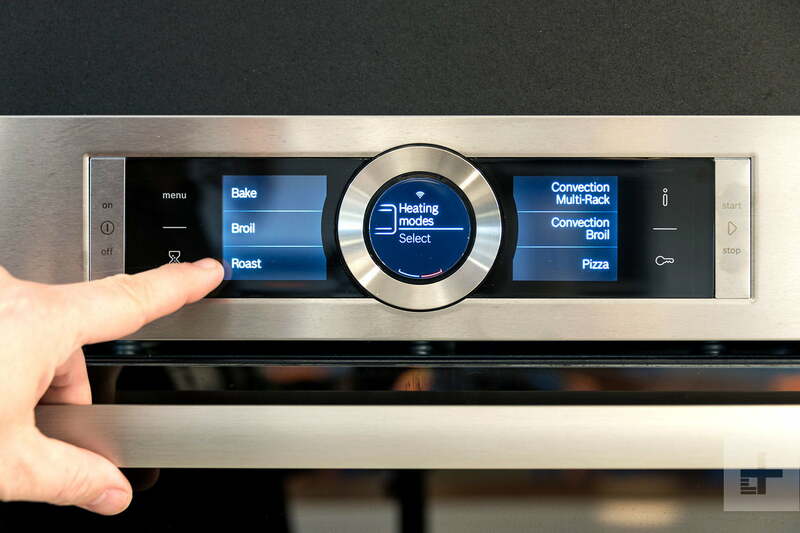 Essentially, while everything is touch-sensitive, the ring is responsible for making things happen with the oven. The ring is one of our favorite features on the oven. We just wish it didn’t feel so hot to the touch after the oven has been on for a while. The oven comes with quite a few cooking settings, including one for pizza. You’ll also find settings for roast, convection multi-rack (for baking or roasting on one or more levels), slow cook, proof (for rising dough or yeast), warming, plate warming, defrost, bake, and broil. With these settings, you can do everything from baking a chicken or bread to serving your meal on a warm plate. Like many appliances available today, the Bosch HBE5452UC 24-inch wall oven aims to be part of the smart home revolution. 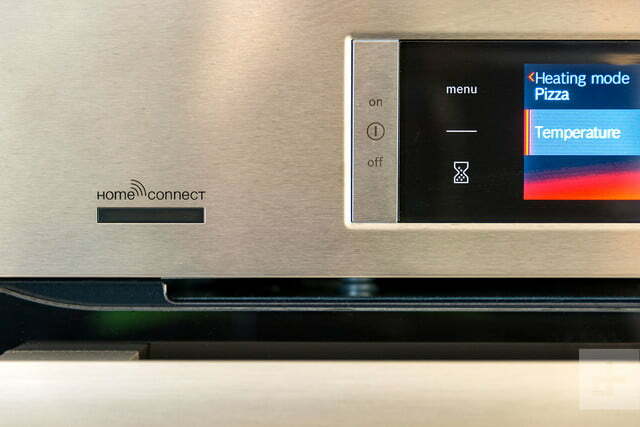 In fact, Bosch calls its version of the feature “Home Connect,” and it’s prominently placed on the top panel of the oven. 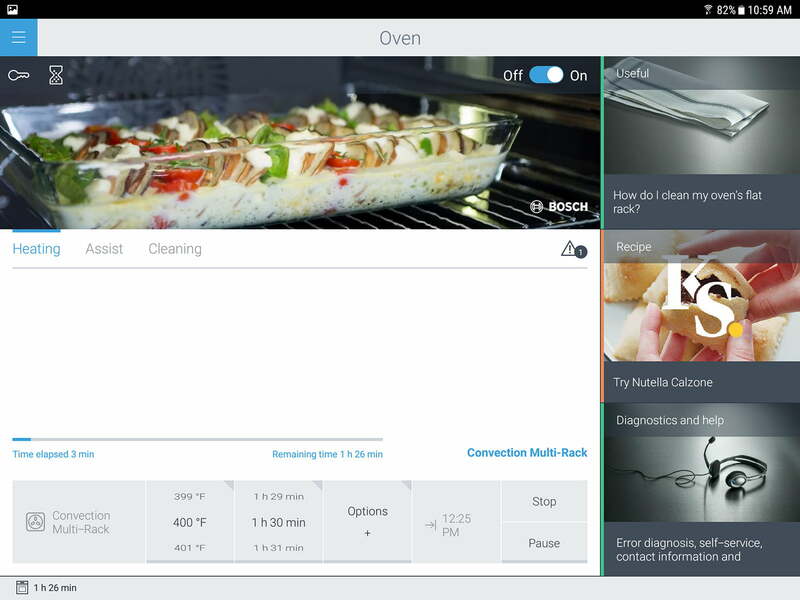 There are settings on the main menu to help you connect the oven to your mobile device. The application is pretty slick. It includes recipes with cooking instructions that you can send directly to the oven once you’ve prepared the ingredients. 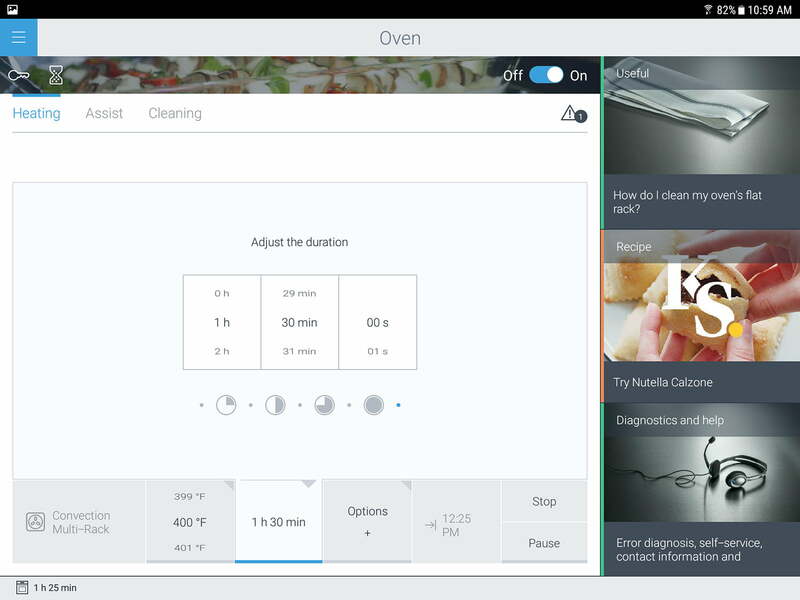 You can also pre-heat the oven from your phone and receive notifications when a meal is ready. 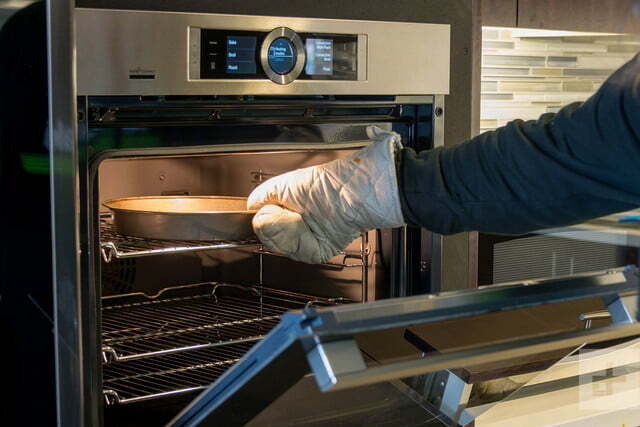 You can adjust the oven temperature from your phone — you know, in case getting off the couch is just too much to do, or you’re deep in conversation at your dinner party. If you have a Nest thermostat, you can connect it to the oven and instruct the device to turn off the appliance when you’re away from home. We should note that initially we had trouble connecting the oven to the app, and a previous version of this review outlined our troubles. But after troubleshooting with engineers from the Bosch team, we were able to get up and running and were overall impressed with what it could do with a few minor exceptions. After connecting the oven to the app, we decided to re-test, armed with recipes for rosemary chicken, roasted potatoes and lemon garlic asparagus. 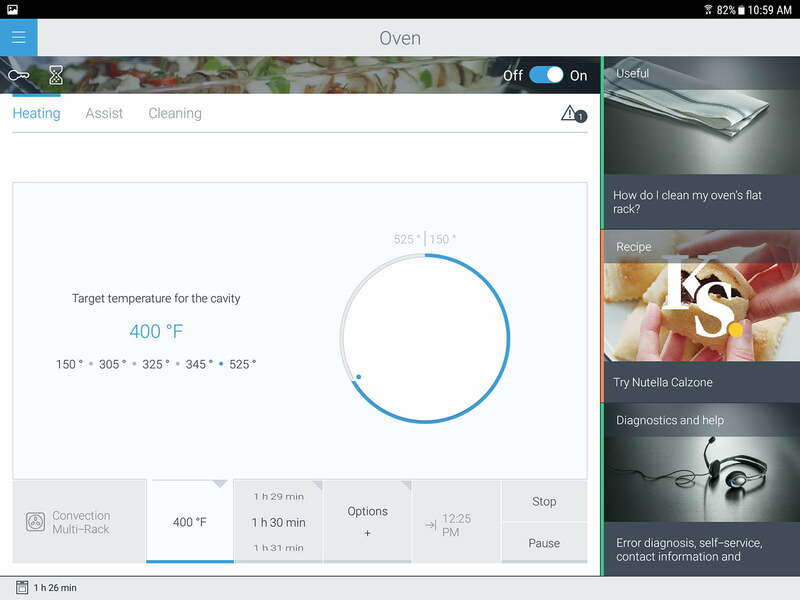 The app allows you to do many things, including adjusting the temperature, setting a timer for when you want to stir the potatoes, scrolling through recipes, and more. We wish that there are more recipes to choose from in the database, but we’ve been told that more are coming. We appreciated that we were able to put our chicken in and walk away while monitoring progress on the app. When you open the app, there’s an on/off button on the top right corner. Tap it and you’ve turned on the oven. Across the top, there’s a picture of an empty oven, and when you tap “on” a light comes on on the picture, simulating a live camera inside the oven. We got really excited when we first saw this, as we thought it was indeed a live camera of our very own appliance. How awesome would it be to be able to check on our casserole by watching it bubbling, or making sure it hasn’t caught on fire? But sadly, the picture is a facade – it isn’t a live cam but a photo illustration. We get that cameras are tricky to install in ovens, but felt like Bosch should consider the task now that they’ve teased us with the idea of having one. Aside from a lack of a camera, we appreciated that we were able to put our chicken in and walk away while monitoring progress on the app. We also appreciated that we could set a timer directly on the app reminding us to stir the potatoes in 10 minutes. You can watch the oven’s progress on the TFT screen and judge how much longer it will take to heat up based on the display info. This information is illustrated with a red line slowly moving around the ring controller. If you’re looking for a small oven that does a decent job at cooking, the Bosch won’t disappoint. In addition to baking chicken using the convection option, we used it to heat up food and make cookies. Overall, the oven performed well and cooked food evenly every time. When the oven is on, the inside light is illuminated, so you can easily monitor cooking progress. 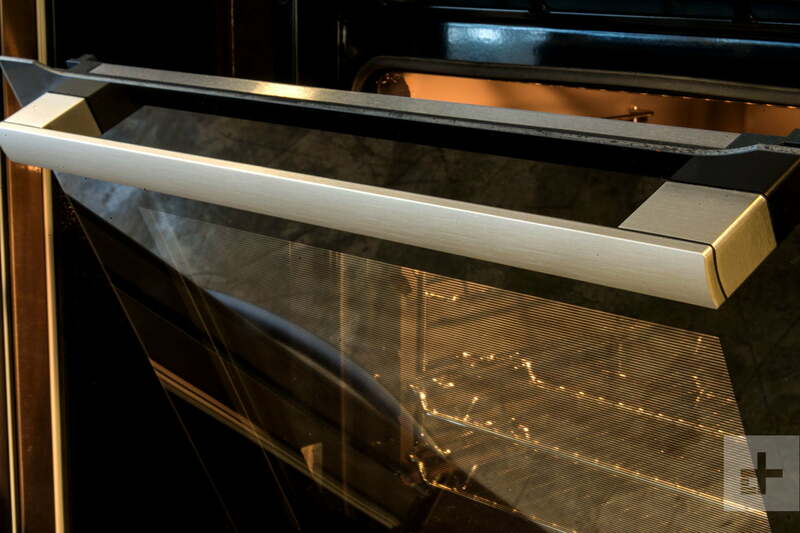 When the oven is on, the inside light is illuminated, so you can easily monitor cooking progress. You can turn off this feature in the settings, but having the light on is the default setting. When something is cooking, the timer displays the countdown time and predicted end time. All this information is reminiscent of a car’s dashboard. 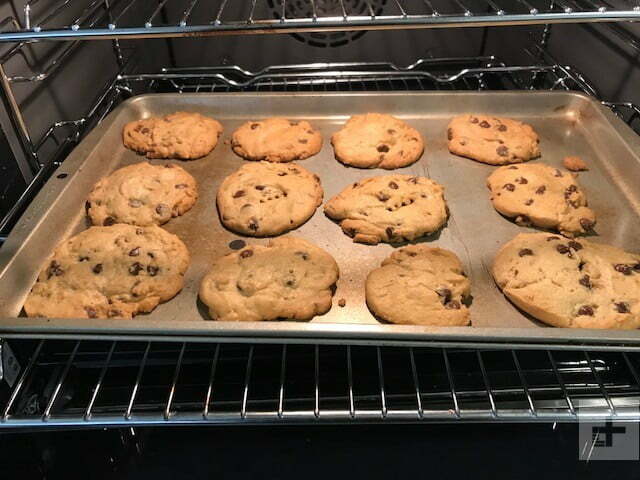 We baked a batch of chocolate chip cookies using store-bought dough on both the convection and bake settings. The cookies turned out much better on the bake setting. The convection setting delivered cookies that were a bit too chewy. On the bake setting, the cookies came out perfect, but required the full 15 minutes of cooking time denoted on the dough packaging. Since there was a pizza setting, we had to take that for a test spin. It automatically set the temperature to 400 degrees. 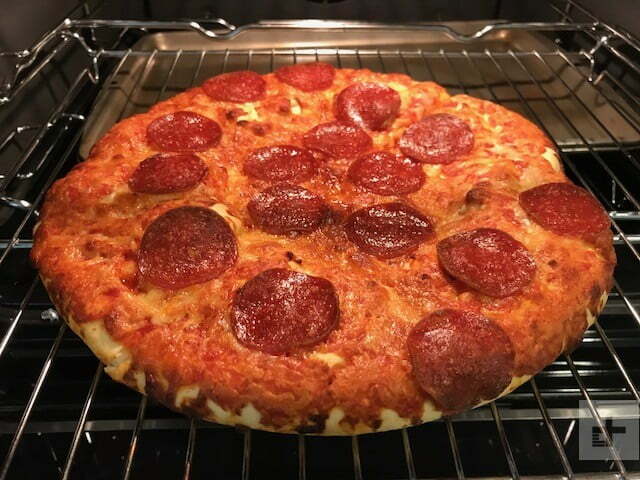 We inserted a Digiorno pepperoni pizza with a cheese-filled crust into the oven and cooked it for 25 minutes. That’s about five minutes longer than the package suggests. The pizza came out fine, but it definitely didn’t taste like delivery. Our rosemary chicken meal was the highlight of our testing and turned out delicious. We used the convection setting and found that it reduced overall cooking time. While we couldn’t fit two cookie sheets with the potatoes and asparagus in the oven at the same time, we were able to set timers on the app reminding us to swap out as necessary. The Bosch HBE5452UC 24-inch wall oven 500 series comes with a one-year limited warranty. If the unit fails to operate properly under normal conditions within that time and it’s deemed the result of a manufacturing defect (materials or workmanship), then Bosch will repair or replace it free. There’s no denying that this Bosch wall oven is attractive, and it does a decent job cooking food. The app serves as a solid remote control. But with a price tag of $1,999, it’ll cost you. 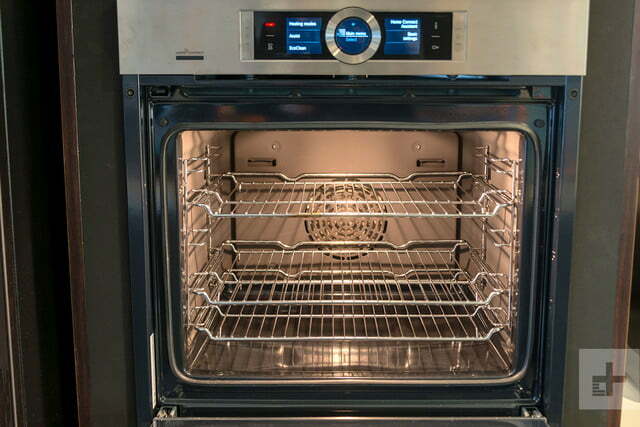 If money is a concern, but you still want a high-quality oven, consider the Frigidaire 24-inch single wall oven. It costs about $500 less and you won’t need to buy smaller cookware to ensure it’ll fit. Product longevity varies among ovens, but a wall oven should last somewhere between 11 and 15 years. Any issues you might have with the unit will likely appear during the limited warranty period. If you like the way the Bosch oven looks, value the brand, and have some extra dough to spend to get exactly what you want, then do it. There are other models that are bigger, and cook just as well if not better for less money. But they just don’t look as good. 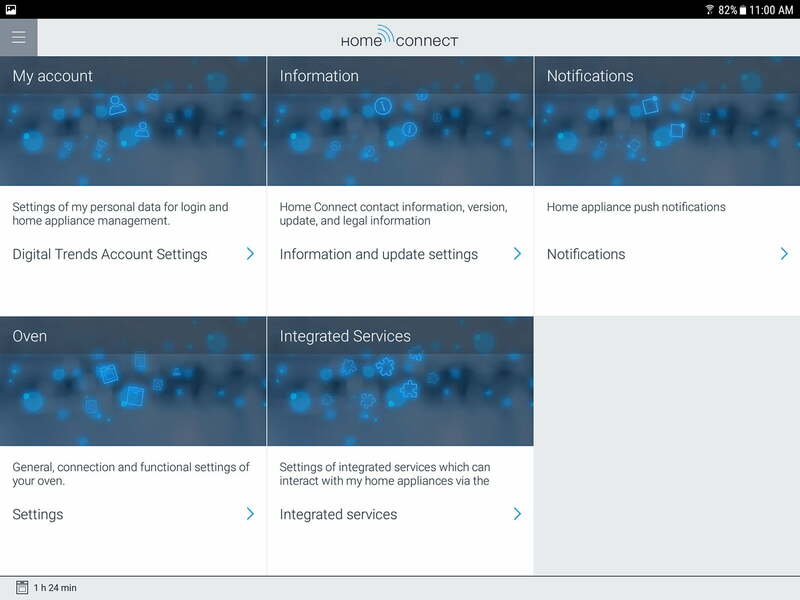 Updated April 20 to add significant detail on the Home Connect app and bump up the score to reflect our testing of the app.